Walton, Mark D, de Bettencourt-Dias, Ana. 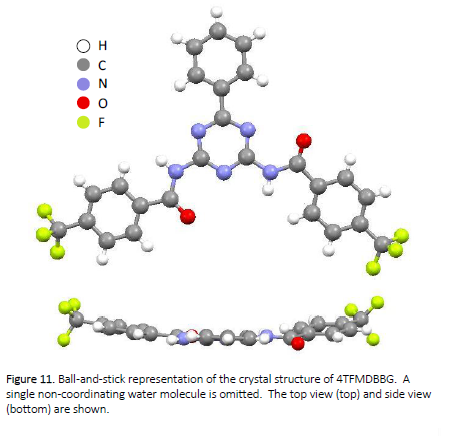 “Synthesis and Characterization of 4-(Trifluoromethyl)-dibenzamide-benzoguanamine and Crystallographic Characterization of a p-Triflourobenzoic Acid Complex of Terbium(III).” Nevada State Undergraduate Research Journal. V1:I1 Fall-2014. (2014). http://dx.doi.org/10.15629/6.7.8.7.5_1-1_F-2014_3. 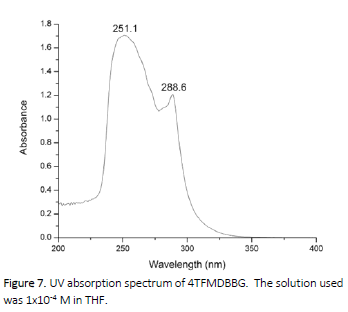 A molecule that coordinates with lanthanide metal ions and luminesces under UV light, 4-(trifluoromethyl)-dibenzamide-benzoguanamine (4TFMDBBG), was synthesized in 61.2% yield. 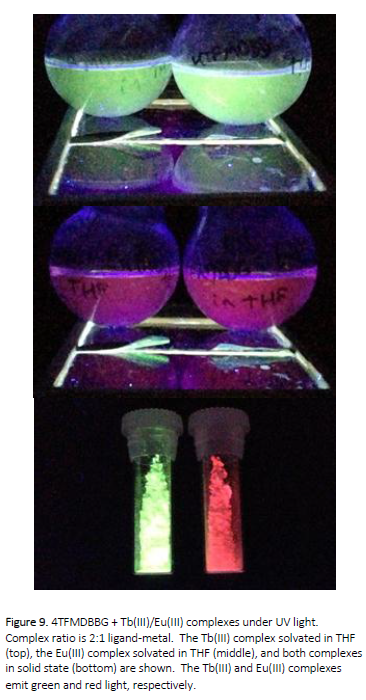 When complexed with europium and terbium, red and green luminescence, respectively, was observed under UV light. Crystals of the ligand were isolated and its crystal structure was determined. Further characterization by NMR and UV-Vis spectroscopy and mass-spectrometry were performed. Crystals of a metal complex of a side product were also isolated and its crystal structure was determined. 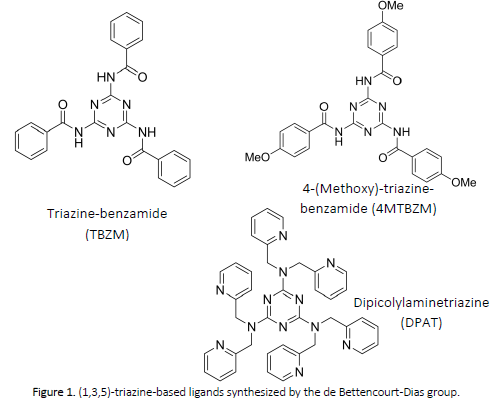 In an effort to better understand binding modes in lanthanide metal ions while sensitizing their luminescence, our research group has synthesized and characterized (1,3,5)-triazine-based ligands with three identical arms as shown in Figure 1; the presence of these arms lead to many possible coordination sites. 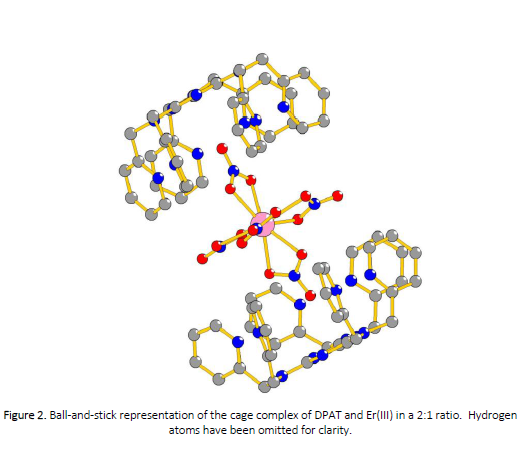 The first of these ligands, DPAT, formed cage complexes around the metal ions instead of coordinating to them, as seen in Figure 2.7 In an attempt to have the ligands coordinate directly with the metal center, Dr. Joshua Zimmerman synthesized a similar melamine-based ligand with fewer coordinating sites, TBZM, as shown in Figure 1. Upon complex formation, the ligand coordinated directly with the metal; however, a byproduct of the reaction, benzoic acid, led to bridging between two metal centers, each with one coordinated ligand, as depicted in Figure 3.8 In addition, most likely due to the presence of three possible coordination sites on the ligand, isolation of more metal complexes was not possible. To overcome the problem of too many coordinating sites leading to difficulties in crystallization, ligands with only one coordination site were synthesized so that the metal ion has only one place to bind. 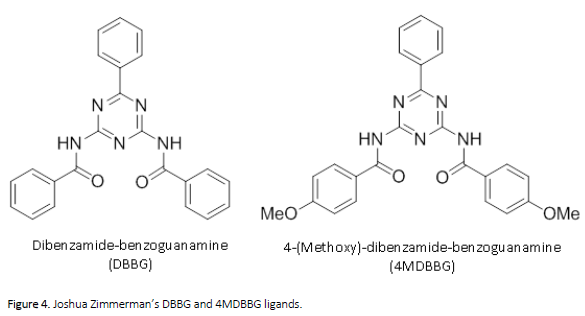 4-(methoxy)- dibenzamidebenzoguanamine, 4MDBBG, as shown in Figure 4. All NMR spectra were recorded using Varian 400 or 500 MHz spectrometers. UV-Vis spectroscopy was performed on a Perkin-Elmer Lambda 35 spectrometer. 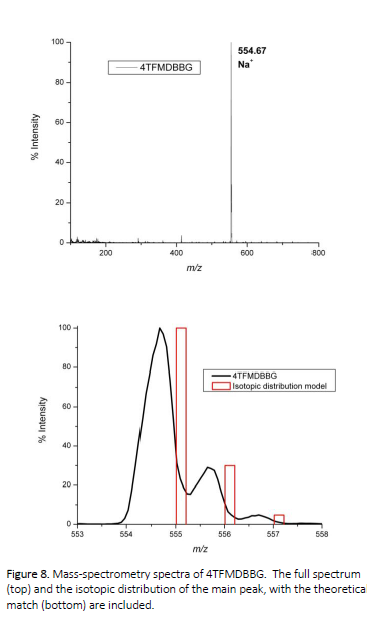 Electrospray ionization mass spectra (ESI-MS) were recorded in positive ion mode on a Waters Micromass ZQ quadrupole mass spectrometer; samples for this were prepared to a concentration ~ 1 mg/mL in methanol and filtered through a 0.2 μm syringe filter. X-ray crystallography was performed by mounting crystals on a glass fiber and placing them in a low-temperature nitrogen stream in a Bruker SMART CCD area detector diffractometer using graphite-monochromated Mo-Kα radiation. A 1:4 ratio of benzoguanamine (BG) to 4-(trifluoromethyl)-benzoic anhydride was used (0.1 g and 0.7774 g, respectively) and the reaction was carefully maintained between 130°C and 140°C. Some of the anhydride sublimated to sides of the flask, but most of it melted and dissolved the BG. The reaction was maintained under nitrogen. After about 30 minutes, a pale yellow product started solidifying in the bottom of the flask and would not melt at 150°C. The whole flask, including the pale yellow product at the bottom and the sublimated byproducts, was washed with toluene. This product was then dissolved in minimal hot toluene and cooled to precipitate out the product. The product was filtered and washed with about 15 mL cold toluene and weighed 181.2 mg (61.2% yield). 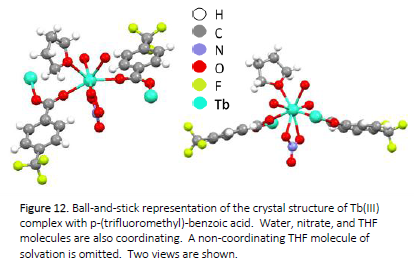 X-ray quality single crystals of the ligand 4TFMDBBG and the Tb(III) complex with 4-(trifluoromethyl)-benzoic acid, were both isolated by slow diffusion of pentane into THF in a crystallization tube and breaking open the tubes to retrieve the crystals after formation. The crystals from the Tb(III) complex were rod shaped and very thin. The crystals from the 4TFMDBBG ligand resembled thin rhombic prisms. Ligand 4TFMDBBG was synthesized following the reaction shown in Scheme 1, by reacting benzoguanamine (BG) with an excess of 4-(trifluoromethyl)-benzoic anhydride (4TFMBA). Several reaction conditions, both in solution and neat, were screened. Solution reactions did not yield the desired product or led to the half-substituted product, as suggested by 1H NMR. However, melting the products together in the absence of solvent proved successful, as indicated by the 1H NMR spectrum in Figure 5. Peaks at 7.59, 7.47, and 8.31 ppm correspond to the phenyl protons A, B, and C, respectively; peaks at 7.82 and 8.05 ppm correspond to protons in the benzamide protons E and F, respectively; the peak at 8.88 ppm corresponds to the amide proton D. In theory, synthesizing this ligand requires a 1:2 ratio of BG to 4TFMBA, but in practice, a 1:4 ratio was more successful, because a portion of 4TFMBA would sublimate instead of melting to react with BG; the sublimated compound was confirmed by 1H NMR to be 4TFMBA. Figure 6 shows a 13C NMR spectrum of the ligand. All the carbons are accounted for and in corresponding regions except for the trifluoromethyl carbon, L, which we predict would show up around 40 ppm. A more concentrated solution and more scans would most likely produce this signal. The spectrum shows peaks at 125.92, 125.95, 128.31, 128.69, 129.10, 130.52, 133.48, 134.37, and 137.01 ppm which correspond to aromatic carbons A, B, C, D, H, I, J, and K; peaks at 164.57 and 164.95 ppm correspond to the triazine carbons E and F; the peak at 173.90 corresponds to the amide carbon G.
Figure 7 shows the UV absorption spectrum of this compound. Absorption maxima at 251.1 and 288.6 nm correspond to aromatic π → π* transitions. 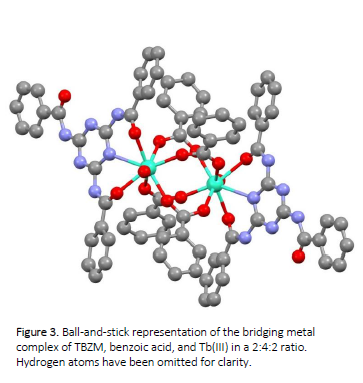 Metal complexes have been isolated, but their absorption spectra have not been measured yet. Mass-spectrometric characterization of the compound was performed as well. The spectrum is shown in Figure 8 (top). The major mass peak corresponds to the ligand bound to a sodium ion. The isotopic distribution model, shown in Figure 8 (bottom) is off by about 0.5 m/z, which is within the instrument error (± 1 m/z). 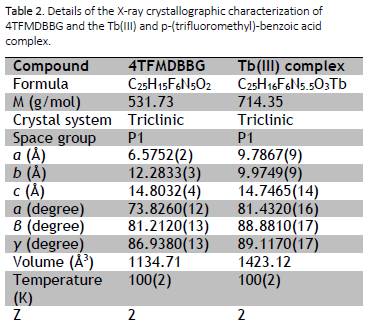 Complexes of 4TFMDBBG with Eu(III) and Tb(III) nitrate and triflate salts were isolated in a 2:1 ratio of ligand to metal by dissolving in THF and stirring at room temperature for 24 hours and removing the solvent under reduced pressure. All of these complexes luminesced brightly in the colors characteristic of the metal ion under UV light, which are shown in Figure 9. Single X-ray quality crystals were isolated of the ligand alone and of complexes. 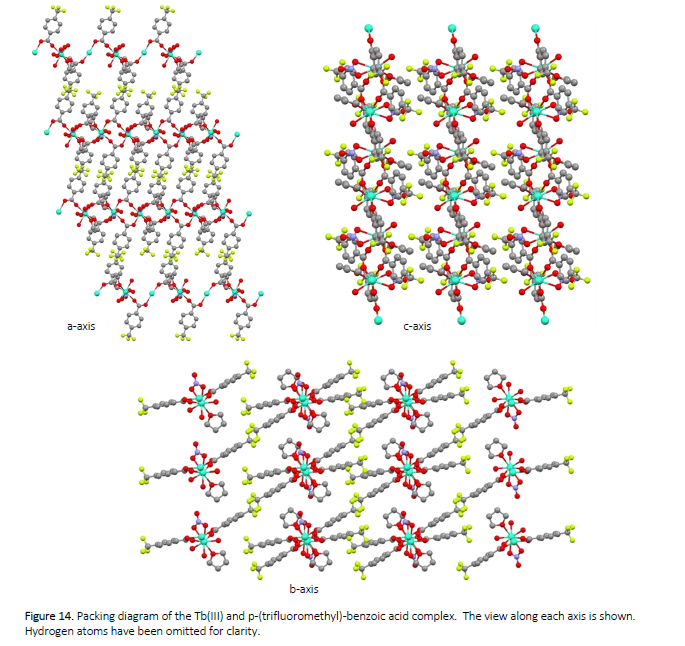 Crystals of the ligand by itself (Figure 10) were obtained by slow diffusion of pentane into THF. The crystal structure obtained (Figure 11) shows that in the non-coordinated state the amide oxygen atoms point in opposite directions and, in side-view, the ligand displays a concave conformation. As shown in Scheme 1, 4-(trifluoromethyl)-benzoic acid is a byproduct of the ligand synthesis. After setting up crystallization of an impure batch of ligand with Tb(NO3)3 in a 2:1 ligand-metal ratio, a crystal of the complex of Tb(III) with this byproduct as the ligand was isolated. Its structure is shown in Figure 12. In this complex each terbium ion is bound to two bridging ligands through their carboxylate functional groups, as well as to one solvent THF molecule, two water molecules, and a nitrate counter-ion. 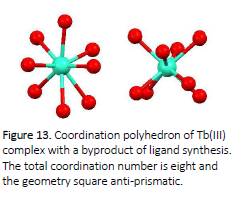 The total coordination number is eight and the coordination polyhedron around the metal ion is a square anti-prism, as shown in Figure 13. 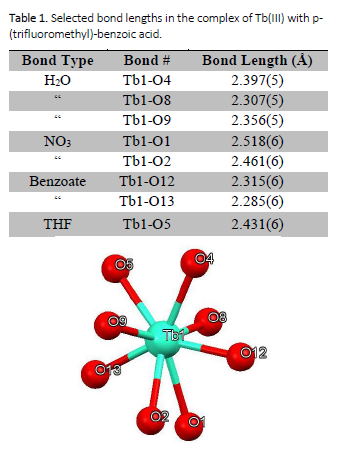 Selected bond lengths of this complex are listed in Table 1 and are within expected ranges. 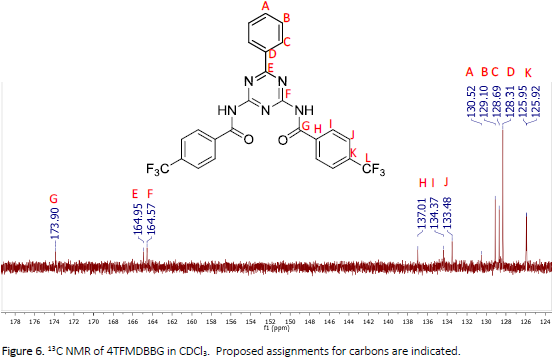 A new ligand, 4TFMDBBG, was successfully synthesized in good yields (61.2%). The luminescence of its solutions with europium and terbium salts indicates a successful coordination to the metal ions; however, isolation of X-ray quality crystals has yet to be accomplished and extensive emission spectroscopy will be performed in future work. 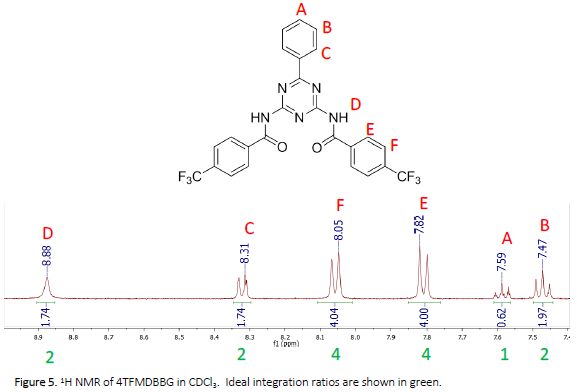 Spectroscopic characterization of complexes of this ligand with complexes of the analogous ligands with other substituents will reveal the differences in sensitizing ability as a function of the substituents, CF3, OMe, and H. A new complex of Tb(III) with 4-(trifluoromethyl)-benzoic acid was isolated, indicating the presence of a onedimensional coordination polymer. Its spectroscopic characterization will be undertaken and direct synthesis from the commercially available ligand will be done. Ligand – an atom or molecule that binds to a metal atom to form a complex. Complex – a molecule that consists of a metal center with other atoms or molecules bonding to it. Coordination – direct bonding between ligands and metal centers. Luminescence – the light emitted by an atom or molecule after being excited by an external source (i.e. visible/ultra-violet light, electricity). Coordination polymer – a macromolecule that consists of repeating subunits where bonding occurs between ligands and metal centers. Crystal – a solid form of an atom or molecule that consists of highly repeated units. Spectroscopy – analysis of an atom or molecule using different forms of electromagnetic radiation. Dr. Ana de Bettencourt-Dias, Dr.Joshua Zimmerman, and Jeffrey Rossini are acknowledged for help with analyzing spectra and assisting with crystallography.